No need to move far from town to get postcard-perfect farm views. 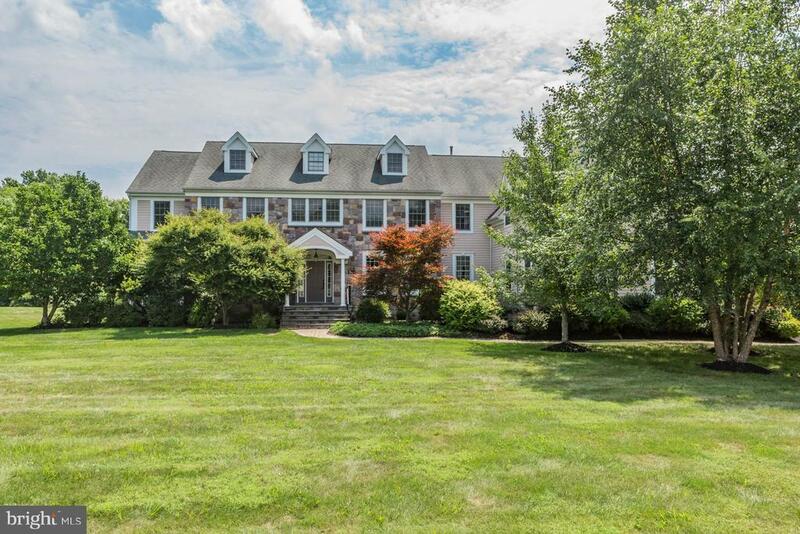 This house with a timeless stone facade and a modern open floor plan is situated within the triangle of Princeton, Pennington and Hopewell Borough, yet a pastoral vista from the deck suggests otherwise. When working from home in the sunny corner office, just gaze out the window or step out to the covered porch and stress melts away. Other main floor rooms are pleasantly open, including the two-story family room with stone fireplace and dramatic windowed bay. The cherry and granite kitchen has a wraparound island, a sun-drenched cathedral breakfast room and a walk-in pantry. Dentil moulding and wainscoting give the dining room a dose of formality. Tucked away near a back staircase are a guest room and tiled full bath. Above, two bedrooms share a Jack & Jill bath, while a third bedroom shares a bathroom with a large game room. The master suite boasts a walk-in closet, sitting area defined by columns and a travertine-dressed bathroom with corner tub. The full day-lit basement opens to the lovely 2-acre yard.